(1904-1978) Sydney Brenner Taylor grew up among immigrant families on New York City's Lower East Side prior to World War I and wrote the All-of-a-Kind Family series for her daughter. She was a writer, actor, and dancer who won many awards and for whom a Jewish children's book award is now named. Do you remember the story of children doing their cleaning chores and being rewarded with found pennies and buttons? If so, you aren't alone. This is the series of the charming Jewish family known as All-of-a-Kind. * All-of-a-Kind Family. Illustrated by Helen John. Follett, 1951. * More All-of-a-Kind Family. Illustrated by Mary Stevens. Follet, 1954. * All-of-a-Kind Family Uptown. Illustrated by Mary Stevens. Follett, 1958. * All-of-a-Kind Family Downtown. Illustrated by Beth and Joe Krush. Follett, 1972. 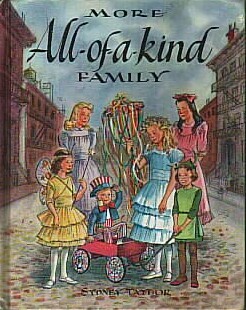 * Ella of All-of-a-Kind Family. Illustrated by Meryl Rosner. Dutton, 1978. Danny Loves a Holiday. E.P. Dutton, 1980. The Dog Who Came to Dinner. Follett, 1966. Mr. Barney's Beard. Follett, 1961. A Papa Like Everyone Else. Follett, 1966.